Our third day in Beijing started with the highlight of the tour for many so far: an exclusive breakfast meeting with Dr. Kai-Fu Lee, the VP of Google China. A big thank you goes to our sponsors: the General Manager of the Marriott Beijing City Wall who provided fantastic food and a perfect location. It was also great to meet up with Adam Schokora from our lead sponsor Edelman Digital, who flew in all the way from Shanghai to join us for the session and the subsequent visit to the Forbidden City. 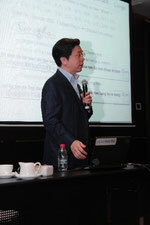 We were able to live stream the entire session and you can find the recordings on our Web2Asia channel below or at: http://www.kyte.tv/ch/172789-web2asia. Next destination was the Forbidden City, where we met with IBM China and the Management of the Palace Museum. 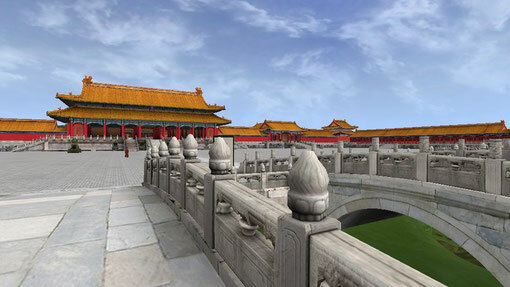 During the last 3 years they have jointly developed a project called Beyond Space and Time: The Virtual Forbidden City is a 3-dimensional virtual world where visitors from around the world can experience the Forbidden City in Beijing. You can explore the magnificient palace as it was during the Qing dynasty, which ruled from 1644 until 1912, the end of the Imperial period in China. This huge palace complex was completed in 1420 and covers more than 72 hectares (178 acres). The cool thing is that it can not only be experienced in the showroom of the Palace Museum but also downloaded & explored at the official website www.beyondspaceandtime.com. Check out Shel Israels blog post on his Forbidden City experience here and a pic from Adam Schokora here. 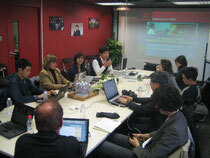 Our last company visit of the day was ChinaCache - the leading Content Distribution Network (CDN) provider in China. Simply put, the company helps its customers to better deliver their online content to its users in different geographical locations and within the networks of the many Internet Service Providers in China. This is to guarantee to high performance, security and scalability. Customers include large domestic & international players such as Sina, Netease, eBay, MSN, Amazon, Myspace China and many more.